Awatif Baroud, Chadian entrepreneur, showing off her food dryer in N'Djamena. Although Chad, a poor landlocked country in the Sahel region of Africa, has been primarily reliant on its oil and extractive industries, one N'djamena-based entrepreneur believes that enabling women and promoting Chadian goods would be beneficial not only for the people, but to promote a healthier country as well. "Chad is a country with lot of natural products but we export all the raw materials and we import all our processed goods. We don't have factories, we don't process anything here," says Awatif Baroud, a female entrepreneur at her home in Mardjane Daffac neighbourhood in the country's capital. Her vision to build up her small business focuses on creating Chadian products made with raw materials sourced in Chad not an easy feat for a woman in a very conservative country. "Chad is rich in livestock, but we export most of the animal skins, so I decided to create my company to produce bags," says the 50-year-old owner of Soum Soum, which means sesame in Chadian Arabic, a bag company based in N'Djamena. "We have a tannery in our country, so I buy the skins from there, and have a team of artisans that work with me they have a knowledge in handicrafts," she says. Her products include hand-made briefcases, all types of women's handbags, wallets, belts, and desk sets. Some of her designs also incorporate colorful pagnes, or printed cloth, that make up motifs on the bag and lining. According to a report from the 2016 UN Economic Commission for Africa, manufacturing contributed 2.4 per cent of Chad's GDP in 2016. The country is mainly reliant on oil exportation. Stylish leather goods are just part of Baroud's business plans. She has begun to manufacture skin and hair care products based on Chadian traditions. "I started making skin and hair care products for women from shea butter, honey, beeswax and sesame oil. I only import the packaging," says Baroud. She would like to see more products manufactured and sold within Chad including food. Finding funding to open a business is part of the struggle, she says. "Chad is a very poor country, and we don't have financial institutions to empower women in their businesses," she adds. Berud had a job, and saved 100 US dollars to start her first business. "Running a business as a woman is not easy. We have to work hard and face a lot of problems because of religion and society," she says. Muslims make up more than half the population and many women are still expected to stay at home and look after the children. Most Chadian women never had the opportunity to go to school and are illiterate, according to Baroud. "If you want to run a business, you have to have a little bit of knowledge, to be educated to run a business properly. This is one of the obstacles," she says. She attributes part of her own success to the fact that she went to school, but explains that her views did not always necessarily sit well with her husband, who wanted her to stay at home with their child. "I was his second wife there were two of us. And we were treated as if we didn't have any value, we weren't humans, just his property," Baroud says. She divorced him and took her daughter with her, determined to work so she could put her daughter through the best school in N'Djamena. "I want her to be a successful woman. She's not going to be behind a man, waiting for him to feed her or to give her money to buy clothes. I'm not married now, but I'm very happy I'm a successful woman. I failed in my marriage, but I succeeded in my business," she says. Baroud was selected by the World Bank in 2017 to learn how to prepare and dry food using solar technology at a course in Tanzania. The abundant sunshine in the Sahel would seemingly be the perfect place for dried food, but the dust, flies and storage are an issue. "We have four seasons, and in every season, every three months, we have a special vegetable or fruit," says the entrepreneur. "But during the rainy season, sometimes I cannot find food that we can find in the hot season," she says, describing how dried foods would help people have more balanced diets all year round. 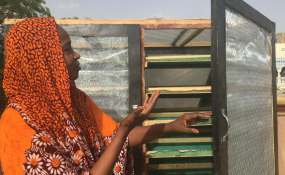 Armed with materials specifically designed for food processing, Baroud returned to N'Djamena and built her own solar dryer on the roof of her home, experimenting with fruit, vegetables, fish, and meat. In the solar dryer, some vegetables and cassava take two days, while okra, or gumbo, takes three days. Fruits, including mangoes, take three to four days, and meat and fish take four days to dry. Once they are taken out of the dryer, the foodstuffs are sealed in plastic packaging, which enables the dried food to be stored hygienically. "The result turned out well- everyone is asking me, 'when can we buy this?'" she says. And while Chad exports its raw materials, it imports food from neighboring countries, an issue that the businesswoman says can be resolved by promoting what is found in Chad. "I would like to get Chadian people to consume natural and local food, instead of imported food," she says. With the help of her solar dryer, Baroud believes she will be able to sell different vegetables and fish all year round. Growing and expanding her business is key for the Chadian entrepreneur, but she wants other women to benefit from the knowledge she has gained. She trained some 150 women earlier this year in food processing. In May, she brought her skills to Bongor, in southern Chad, to teach more than 260 Central African refugee widows how to make soap and process dried food, "so they can go to the market and sell their products and feed their children," she says. Baroud would like to set up a small training school for women to teach food processing and making cosmetics. Her goal would be to train women from around the country, who would then return home to train women in their own region. Although she has struggled to build her business, she believes that female empowerment is key to success. "Every woman has a dream and every woman has a talent. My advice to women all around the world is don't be afraid to take a risk," she says. Read or Listen to this story on the RFI website. Copyright © 2018 Radio France Internationale. All rights reserved. Distributed by AllAfrica Global Media (allAfrica.com). To contact the copyright holder directly for corrections — or for permission to republish or make other authorized use of this material, click here.